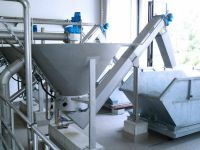 Fine screen – screenings treatment – grit trap – grease trap – grit classifier. The wastewater passes the screen, solid materials are removed and water flows into the grit trap. This prevents sedimentation between screen and grit trap. 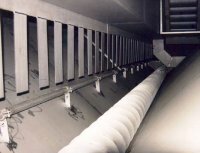 A grease trap with fine bubble aeration generating an air roller is located upstream of the grit chamber.